You can convert any content block by calling the convert() method of your editor object. DigitalEdit - Typeset content, suitable for edition (font size that is large enough for editing, expanded graphics). You can convert back and forth between the DigitalPublish and DigitalEdit states. To convert your text content, iink SDK needs to have information about the font you use, which itself depends on your styling options. To do so, it requires you to attach to your editor an object implementing the IFontMetricsProvider interface using setFontMetricsProvider(). As implementing a font metrics provider is a rather touchy task, MyScript provides you via the iink SDK example repository with a reference implementation. If you rely on the reference implementation, registering an editor with the editor view automatically attaches a font metrics provider to your editor. 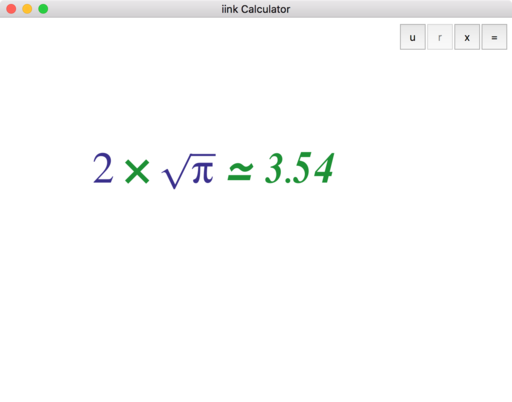 You can add a button to the example calculator to trigger the conversion. As previously explained, associating the editor view with the editor automatically attaches a font metrics provider. As you are dealing with math content and did not deactivate the solver, converting the math will trigger solving, if the required conditions are in place. The next step of the guide will take you through the ability to import or export content.